The protocluster was found in data from the Cosmological Evolution Survey, COSMOS. COSMOS uses the Hubble, Spitzer and Chandra space telescopes with the ground based Keck Observatory and Japan’s Subaru Telescope to get an good look at the universe. COSMOS looks at a tiny region of space — about 0.005% of the whole sky, or two square degrees — in all wavelengths of light, from radio to gamma waves. Peter Capak, the lead author on the paper published in Nature last week, and colleagues knew that extremely bright objects such as starburst galaxies (galaxies with an unusually high amount of star formation) and quasars (the bit at the centre of a massive galaxy that surrounds the supermassive black hole) should exist in very young galaxy clusters, so they first looked for objects giving off a lot of radiation. They found objects emitting a lot of visible light by measuring optical and near-infrared radiation, starburst galaxies by taking radio wave measurements and quasars using X-rays. Once they had located these extreme objects, they looked in the areas surrounding them for unusually large numbers of galaxies given the size of the area — something they called “overdensities”. They then used Hubble and Subaru to measure how far away these extreme objects were, and the Keck II telescope in Hawaii to confirm the observations. 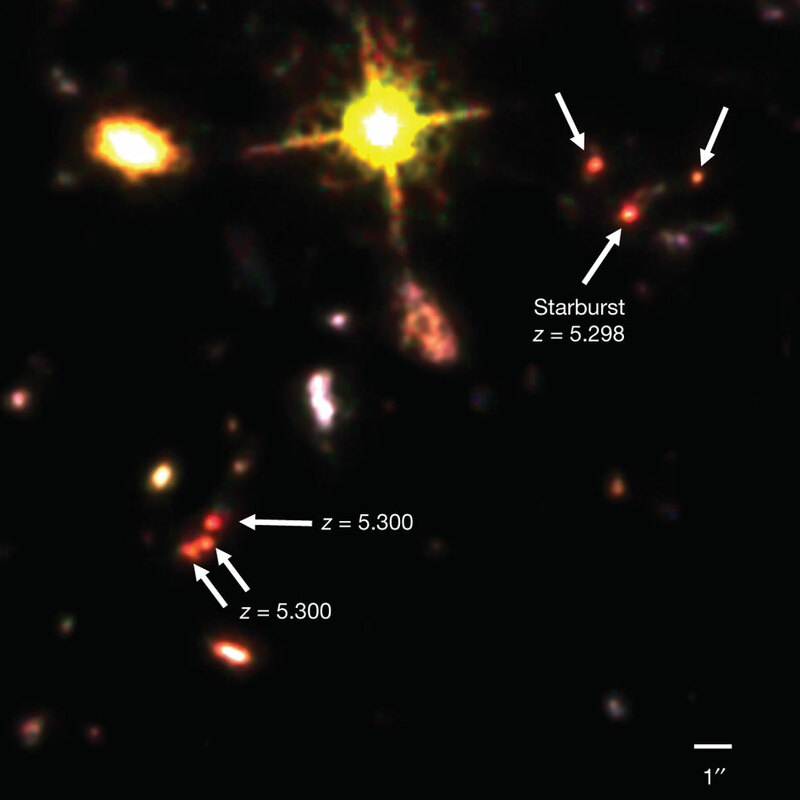 Capak and colleagues were particularly interested in an “overdensity” near a starburst galaxy known as COSMOS AzTEC-3. The area in question contained over 50 billion times the mass of the Sun in gas (and ten times more dark matter), and was brighter than 10 trillion Suns. Stars in the region are forming at a rate of over 1500 a year, more than a hundred times the average value. Around COSMOS AzTEC-3 there were 11 bright galaxies — 10 more than would normally be expected. This led to the conclusion that what they were seeing was the beginnings of a galaxy cluster, known as a protocluster. Chandra X-ray observations helped to pin down a quasar very close to the protocluster. It can be difficult to find quasars that are this far away because, although they are the most luminous objects in the universe, they’re not usually bright enough to be seen by the telescope. But this one was. The astronomers worked out that the quasar’s black hole must have a mass of between ten and a hundred million times the mass of the Sun. Putting all of this information together, astronomers worked out the total mass of the protocluster. It weighs in at at least ten billion time the mass of the Sun, but could be up to a hundred billion Suns. This confirmed what the astronomers suspected: they were looking at one of the biggest and brightest objects at this distance. 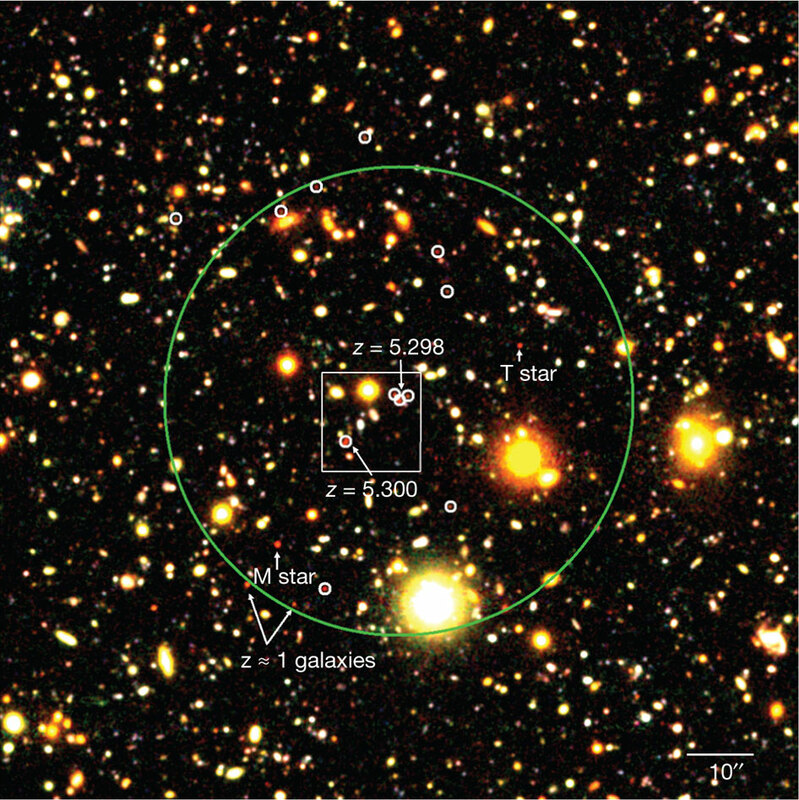 Astronomers also measured the amount of gas in the protocluster. This is what will fuel the protocluster’s growth. They found more than enough to point to a very bright, and massive, future for the baby cluster. It will eventually evolve (or rather, confusingly, already has evolved — depending on which way you look at it) into a massive galaxy cluster. Massive clusters of galaxies have been found from around 4 billion years after the Big Bang, giving this one at least 3 billion years to grow up. Wow! Very exciting and easy to read also. Makes me wish I went into astronomy instead of molecular biology! Thanks Jade, I'm glad you liked it!